Zambian President Michael Sata is threatened by opposition UPND’s growing popularity and has this week not hidden his fears clearly displaying them in public domain by launching attacks on UPND leader Hakainde Hichilema and now a last minute attempt to cancel their planned public meeting in Lusaka, according to Zambia reports. After publishing Hichilema’s personal financial status, which ordinarily is private, and shows outstanding success of an average businessman, President Sata has now ordered police to cancel the UPND’s rally scheduled for Kanyama in Lusaka on Sunday. According to UPND officials, Lusaka police commissioner Dr Solomon Jere acted on State House orders by withdrawing the permit granted to UPND for the public meeting three days earlier. The police offered what appears to be a limping excuse saying their manpower will be devoted to a soccer match between Zambia and Uganda in Ndola which will be played on Saturday a day before the UPND rally. Reports from Zambia’s soccer motherbody, FAZ, reveal that only 850 police officers will be deployed at the match and majority of them are coming from Ndola so as to meet strict budget constraints. Besides the football game and rally will be taking part in two different days on two different days. There are more 20, 000 police officers in Zambia and a potentially peaceful rally by the UPND may only require the presence of between a 100 to 150 police officer while 500 of them are enough to quell a volatile situation in an unlikely event the meeting goes out of control. In a statement issued later, UPND have since rejected to accept the police’s decision to cancel the rally and plan to go ahead with the meeting. 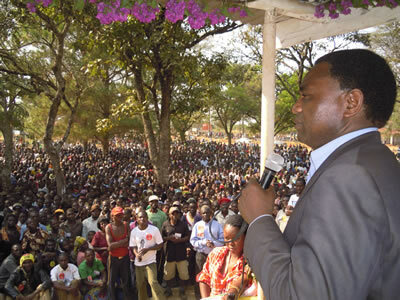 “When we applied for the permit to hold the Kanyama rally, they gave us conditions to provide them with names of those that will speak as well as the names of the youths to assist with maintenance of peace and order, which we did,” the UPND states. “On Monday 03/09/12 we received the acknowledgement to our notification signalling us to go ahead with the rally. We went into full throttle preparing for the rally. The contents of the letter, as read out by the plain clothed officers, was to inform UPND of the police’s decision to withdrawal the permit earlier issued. Police stated in their letter that the ground on which the permit was withdrawn was that all the police officers will be going to the Copperbelt to provide security at the football match between Zambia and Uganda. We politely told the officers to go back with that letter as we were not ready to receive it nor were we ready to accept its content. The reason for cancellation is lame and not convincing as no sane government institution moreover security institution would leave its people unprotected and go to watch football. Are we really safe in this country? While in opposition, President Sata held countless rallies countrywide and faced little or no resistance in accessing police permits for such public meetings.